Not to be confused with Tupolev Tu-154 (YASim). The Tupolev Tu-154B2-2 is a Russian medium-range jet airliner. 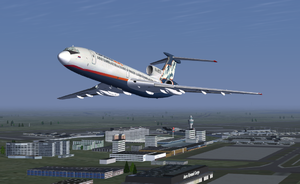 FlightGear's Tu-154 was converted from a model originally designed for Microsoft Flight Simulator by Project Tupolev. Systems and animations had to be re-rewritten especially for FlightGear though. There are two ways to download the Tupolev Tu-154B-2: as a stable release and as a development revision from the SVN server. The latter is known to be a better option since releases are not created very often. However, keep in mind that due to an additional liveries pack in the development revisions, the SVN version of the Tu-154B-2 is not GPL compliant! For to download files tu154b-master.zip open the page and click on the greeb [clone or download] button. Begins to download a 200 MB file. When finished, unzip the file and rename the directory from "tu154b-master" to "tu154b" and then put everything in the folder that contains the Flightgear aircraft. It was featured in the July 2013 Newsletter, which announced its latest updates. This page was last modified on 9 August 2016, at 01:05.